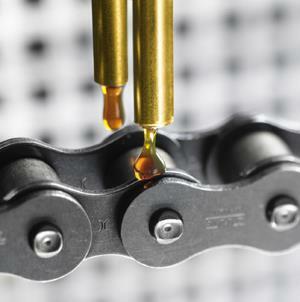 Klϋber Lubrication recently unveiled a new high-temperature oil for lubricating chains. Klübertherm CH 2-140 is intended to offer improved thermal stability and load-carrying capacity, as well as wear protection for bending rods, bolts, rollers and chains in continuous presses for wood-based panel production. Additives in the chain oil are formulated to help dissolve or suspend pasty residues and flush them away from the lubrication point, providing a cleaning effect without disturbing production schedules. Klübertherm CH 2-140 is designed to help keep bending rods and bolts or chain carpet systems clean and running smoothly, leading to efficient press operation and less downtime. Correct and timely use of the cleaning oil can allow users to minimize maintenance efforts normally required for cleaning rolling rods and replacing bending rods and bolts. The new oil can be used for cleaning a variety of chains, bending rods, bolts and chain carpet systems on continuous wood-based panel presses, such as Siempelkamp, Dieffenbacher and Küsters. A leading manufacturer of specialty lubricants, Klüber Lubrication offers tribological solutions to virtually all industries and markets worldwide, with approximately 2,000 employees in more than 30 countries.